Shrimp Pasta in a delicious creamy mozzarella sauce, made completely from scratch with sun-dried tomatoes, basil, and red pepper flakes. A great recipe for shrimp lovers! First of all, let me confess my love for shrimp. It’s one of my favorite types of seafood, and I cook it quite a lot. So, you’ve come to the right place for shrimp recipes! I’ve made all kinds of shrimp pasta through the years, and this recipe definitely stands out as one of my favorites! It was an immediate success in my house! This could become one of your favorite dinner recipes, too! 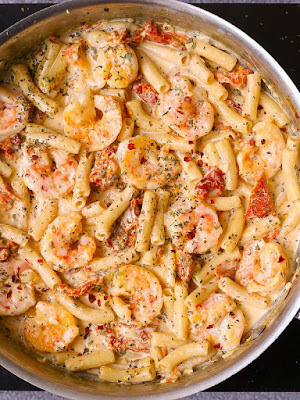 This shrimp pasta is so easy to make! First, cook the shrimp in olive oil with lots of garlic – your kitchen will smell so good! Then, make the cream sauce by sautéing sun-dried tomatoes and garlic, adding cream, basil, red pepper flakes, paprika. 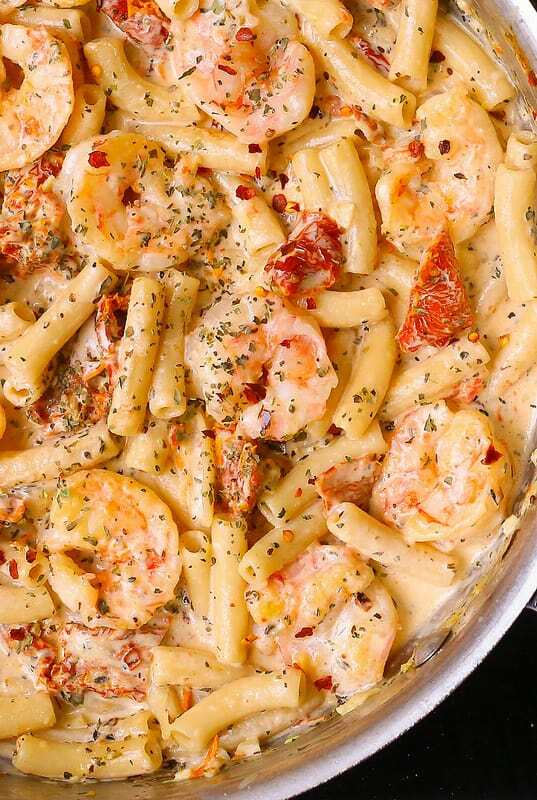 Finally, combine everything together: shrimp, pasta, and the cream sauce! And DONE !! 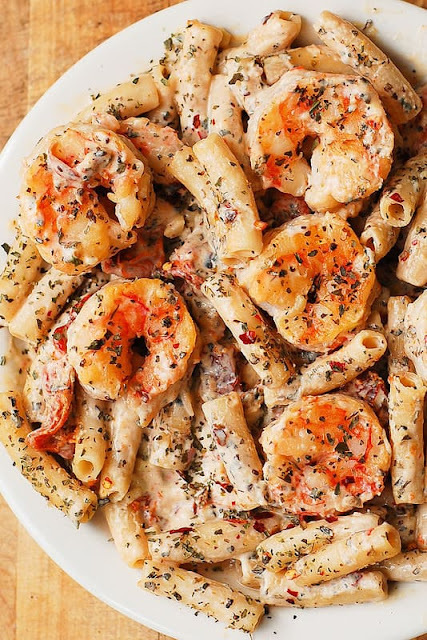 Delicious shrimp pasta with mozzarella cheese alfredo sauce made from scratch with sun-dried tomatoes, basil, red pepper flakes, paprika and cream. You'll have a perfectly cooked shrimp: soft and tender and never dry or rubbery! Heat 2 tablespoons olive oil (reserved from the sun-dried tomatoes jar - see note above, or use regular olive oil) in a large skillet on medium-high heat. Add shrimp, minced garlic and cook the shrimp on one side for about 1 minute, until shrimp turns pink or golden brown on that side. While it cooks, sprinkle the top of shrimp with salt to cover every single shrimp. Make sure not to crowd the shrimp in the skillet, otherwise moisture will form and shrimp won't sear right. After 1 minute, Flip the shrimp over to the other side and cook for about 30 seconds or 1 minute more. The shrimp should be golden color or pink on both sides and not overcooked. Remove the shrimp to a plate, being careful to leave all the oil in the skillet. To the same skillet, add sun-dried tomatoes (drained from oil and sliced into smaller chunks, if needed) and more minced garlic, and saute in olive oil (remaining from shrimp) on medium heat, stirring, for 1 minute until the garlic is fragrant. The skillet should be hot. Add half and half to the hot skillet with sun-dried tomatoes and bring to boil. Add shredded cheese to the skillet, and stir in while boiling. Immediately reduce to simmer and cook, constantly stirring, until all the cheese melts and the creamy sauce forms. If the sauce is too thick, add a small amount of half and half or reserved cooked pasta water. Add basil, crushed red pepper flakes, paprika. Stir. Add 1/4 teaspoon of salt gradually, stirring on low heat and tasting (you might need slightly less than 1/4 teaspoon). Add cooked pasta to the sauce, and reheat gently on medium heat. Add the cooked shrimp, stir it in. Taste, and add more salt, if needed. Add a small amount of half and half or reserved cooked pasta water, if the sauce is too thick. Let everything simmer on low heat for a couple of minutes for flavors to combine.